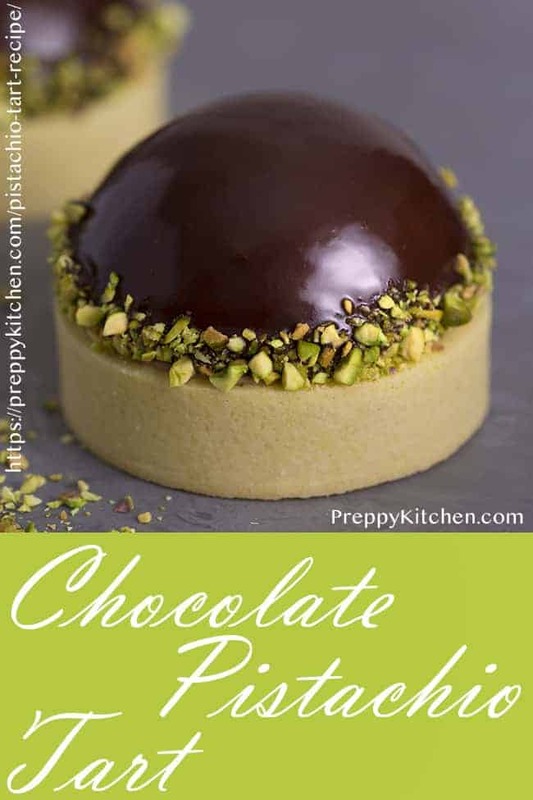 This delicious pistachio tart recipe has a chocolate-covered dome of custard filled, crunchy pistachios throughout and a strawberry surprise in the middle. 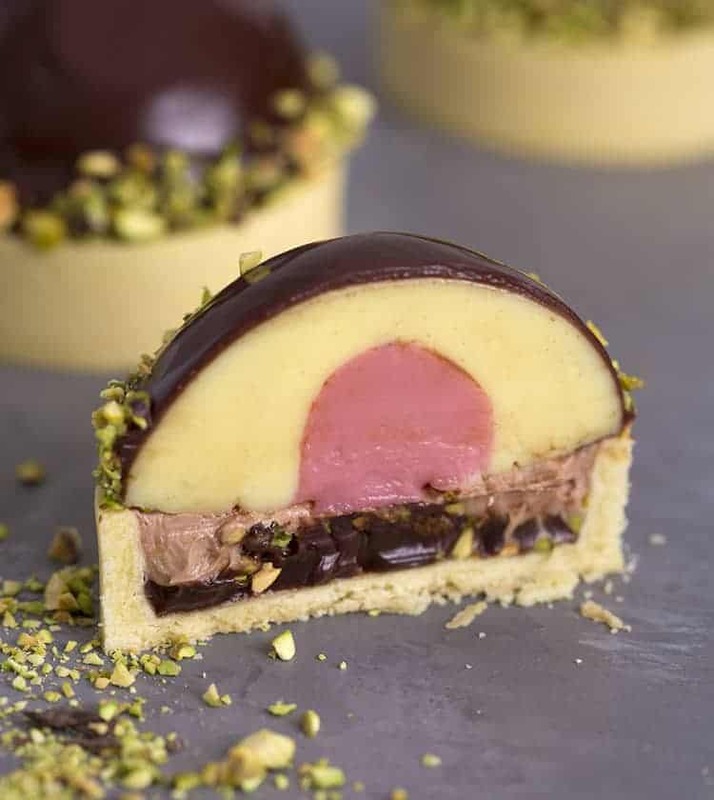 Pistachios need to get a moment in the sun, they’re so delicious and perfect in all kinds of recipes including this decadent tart filled with vanilla pastry cream, lots of different chocolates and a secret strawberry moment in the middle. WHAT are the best TOOLS These TARTS? I used these silicone molds for my domes. 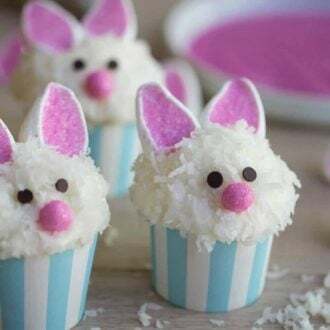 They’re surprisingly handy and perfect for Baked Alaskas too! Only in cross section can you see the layers of flavor that await you in this amazing tart! The strawberry center is totally optional. You could opt for a pistachio cream or chocolate ganache center. The strawberry centers are really optional. Use any flavor you’d like or just fill completely with the vanilla pastry cream. You can add finely chopped pistachios to the dough for some extra flavor and crunch. It will not roll out as smoothly but will taste delicious. To make the molds; as soon as you have your pastry cream made, transfer it to a piping bag, and pipe the cream into the silicon disc molds. Freeze them for 3 hours minimum. (You’ll want to make these molds first). For the tart shells; once your dough is set and chilled, cut out the dough using a 4.5″ round perforated tart ring. Remove the second sheet of dough from the fridge, and cut strips that are about 7-8” long and 3/4” wide, using a sharp knife. Carefully lift the strips and place them on the inside of the tart rings. Press them gently with your fingers against the side and the bottom to mold it to the base of the dough. Place the tart shells into the freezer for 30 minutes to 1 hour. Just before the hour is up, preheat the oven to 320 degrees. Bake the shells for 15 minutes until they are lightly golden. After your molds are ready, it’s time to prepare the chocolate glaze. (You will want to keep the other tarts in the fridge or freezer while preparing each one). Pour the chocolate glaze over each mold and give it a minute to set. To line the bottom of the mold, pour the finely chopped pistachios into your palm, and by tilting your hand, carefully let them fall onto the bottom rim of the mold. Place each mold back in the fridge on a piece of parchment paper to set until assembly. 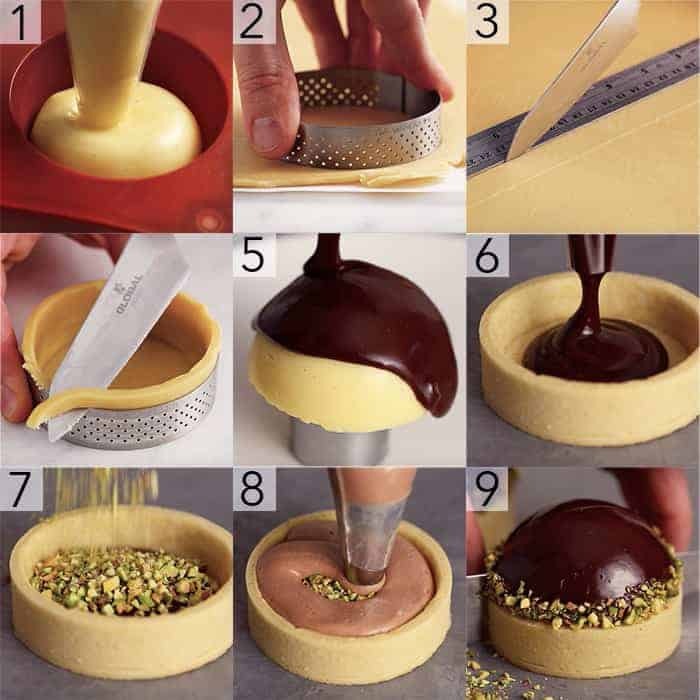 Once your tart shells are fully cooled and you are ready to assemble the tarts, melt the chocolate and transfer it to a piping bag. Snip off the tip of the bag and pipe in the chocolate ganache as the bottom layer of each tart. Sprinkle the desired amount of the finely chopped pistachios into the tarts on top of the chocolate ganache. When the chocolate Swiss meringue buttercream is made, go ahead and transfer it to a piping bag. Snip off the tip of the bag and pipe a layer just on top of the pistachios. Smooth out the top of the chocolate buttercream with an offset spatula. Now go ahead and remove the glaze covered molds from the refrigerator and carefully place them on top of each tart with an offset spatula. 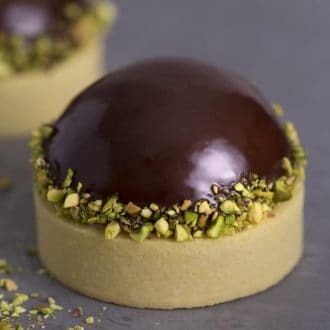 If you’ve tried this pistachio tart recipe then don’t forget to rate the recipe and let me know how you got on in the comments below, I love hearing from you! 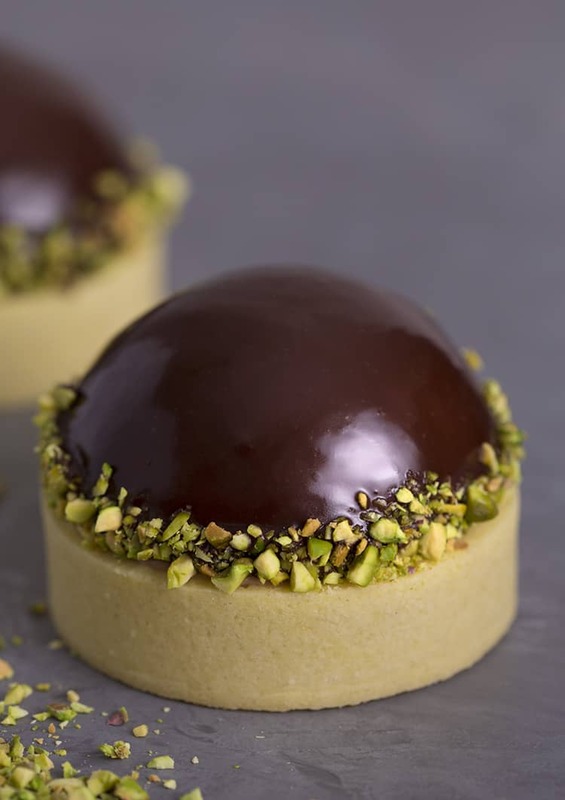 Crunchy pistachios are found throughout this decadent tart crowned with a chocolate-covered custard dome. Add the icing sugar, butter, vanilla & salt in the bowl of a stand mixer fitted with a paddle attachment. Beat the mixture on a medium speed for a few minutes until it forms a paste. Scrape down the bowl halfway through. Slowly add in the flour, and mix on low speed until it is just combined. The mixture will look crumbly. Don't worry as it will come together when rolled and rested. Pour the mixture on a lightly floured surface. You will want to divide the dough into 2 batches to make rolling out easier. Place a large piece of parchment paper down, lightly flour it, and place one batch of dough on top. Sprinkle the dough lightly with flour and place another large piece of parchment paper over the top. Roll the dough out with a rolling pin to 3mm (1/8 inch). I have a rolling pin with training wheels on the side that tells me exactly what 3mm is but you can eyeball it. 3mm is two pennies thick. Place the whole sheet of pastry in the fridge for 30 minutes. Repeat the above steps with the second batch of dough if divided. Cut out the dough using a 5.75" oval perforated tart ring. Peel off the excess dough and you can re-roll this for another use. You can use different dimensions if you have different tart forms. Carefully lift the strips and place them on the inside of the tart rings. Press them against the side so they line up with the dough at the bottom. Pre-heat your oven to 320F. Place the tray with your tart shells in the oven. Bake for 15 minutes or until the shell is lightly golden. In a medium saucepan, heat the milk and vanilla bean to a boil over medium heat. Immediately turn off the heat and set aside to infuse for 15 minutes. In a bowl, whisk the egg yolks and sugar until light and fluffy. Add the cornstarch and whisk vigorously until no lumps remain. Whisk in 1/4 cup of the hot milk mixture until incorporated. Whisk in the remaining hot milk mixture, reserving the saucepan. Mix the gelatin powder and water together, add it to the mixture and give it a whisk. Pour the mixture through a strainer back into the saucepan. Cook over medium-high heat, whisking constantly, until thickened and slowly boiling. Remove from the heat and stir in the butter. Let them cool slightly. Cover each batch with plastic wrap, lightly pressing the plastic against the surface to prevent a skin from forming. Chill at least 2 hours or until ready to serve. (The custard can be made up to 24 hours in advance). Transfer the pastry cream to a piping bag and snip off the tip. Pipe the cream into 4 x 4.5" Silicon Disc molds and freeze for 3 hours minimum. Add egg whites, sugar and salt in a bowl. Give the mixture a brief whisk. Heat the mixture until it reaches an internal temperature of 160ºF or until it's not grainy between your fingers. Transfer to the bowl of a stand mixer with a whisk attachment. Whisk until you get room temperature glossy peaks. Melt the semi-sweet chocolate and allow it to come to room temp. Add the melted and cooled chocolate to one batch. Mix until fully incorporated. 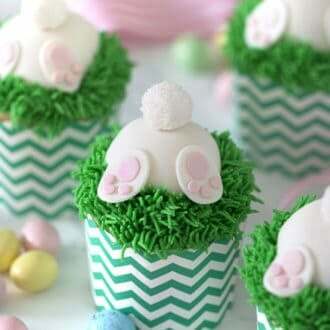 Just before assembling the tarts, give the buttercream a final whip, transfer it to a piping bag and snip off the tip. Melt chocolate and cream together on low heat. Whisk together and set aside. 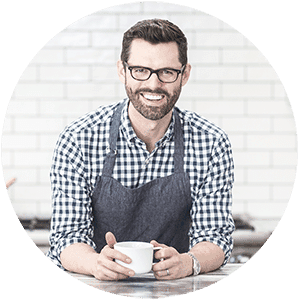 You might need to add more or less cream to achieve the desired consistency. Finely chop the chocolate and put it in a medium sized bowl. Place the heavy cream in a small pot over medium low heat. Bring it to a simmer. Immediately pour the cream over the chopped chocolate. Add corn syrup and the vanilla extract. Whisk until smooth. Once your tarts are cooled and your pastry cream molds are ready, you can assemble your tart. Pour or pipe in the chocolate ganache as the bottom layer of the tart. Make sure your pistachios are finely chopped and sprinkle the desired amount on top of the ganache. Pipe a layer of the chocolate Swiss meringue buttercream on top of the pistachios. Drizzle the chocolate glaze on top of the pastry cream mold. Carefully dip the bottom edge of the mold in the chopped pistachios. Using an offset spatula, carefully place the pastry cream mold on top of the buttercream. The strawberry centers are really optional. Use any flavor you'd like or just fill completely with the vanilla pastry cream. I would live to make the strawberry center on this lovely dessert. Would you upload that part of the recipe? I love pistachio anything! Pastry is my passion, even though I’m not very experienced I do want to give it my all. I’m a retired nurse& now all I can think of is baking & getting more pastries baked. Thanks for sharing the details. I’m ordering the perforated rings & mat. Then I will come back. I’m so excited!!! OH MY GOODNESS!!!! 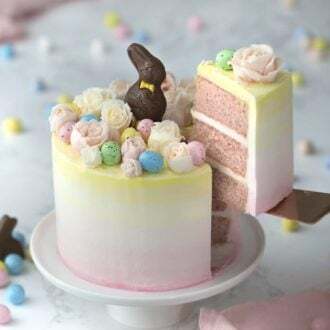 This dessert looks amazing. I gave a 5 star rating from the ingredients and dessert itself. This recipe is truly impressive! Thank you for helping your fans bake like professionals! 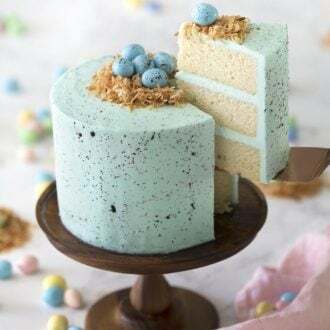 A delicious masterpiece with scrumptious layers of texture!